Piece by Andrew Andersons about the importance of Darling Harbour. It is difficult to find the logic in the NSW Government’s proposals to demolish three public buildings, less than thirty years old, designed by three of Australia’s best architects and to use their sites for replacement buildings. To do this, temporary buildings will need to be procured. To subsidise the cost of this, over a thousand apartments, a high-rise hotel and thousands of metres of commercial space will be built in a manner that puts pressure on some of Sydney’s best parkland and foreshore promenade space. Development proposals were invited by the Government without any apparent regard to assessment of the cultural, social and architectural significance of these sites. There has been no involvement of the general public to participate in a momentous decision of this kind. No criticism is implied of Lend Lease Corporation which has simply responded to the Government’s brief in a competitive bidding process. Darling Harbour is the NSW Government’s finest achievement in the 1980s and 90s and was the focal point of the 1988 Bicentennial Celebrations. The development is hugely popular with the general public, overseas visitors and organisers of convention and exhibition activities. However it has been somewhat reviled by the “design community” and the City of Sydney. • The unpopularity of Darling Harbour Authority Act of 1984 which gave the Authority and Minister unprecedented powers (This Act was repealed in 1994). The Act streamlined approvals to effect early completion but was strongly criticised by the “planning community” and City of Sydney. • The unpopularity of the monorail which was approved under the Act despite sizeable public protest rallies. • The snobbery of Sydney’s “opinion leaders” because of the perception of a low-class demographic of many of the visitors (“Westies”) – yet this is the visitor category the Wran Government particularly wanted to attract. • The perceived lack of “connectivity” of Darling Harbour with the CBD and Pyrmont. This is an aspect of Darling Harbour that could be improved especially towards the South to Quay Street. However these criticisms are largely ideological and representative of conventional solutions which do not bear scrutiny when examining the detailed conditions imposed by level changes, freeways and pedestrian desire lines. • The desire by the City of Sydney to replace Darling Harbour by a low-rise “urban grid” of housing as illustrated in its “2030 Vision” and to build convention and exhibition facilities over railroad tracks to the south of Central Railway Station. • Objections to the Darling Harbour scheme by conservation groups for its disregard for the industrial heritage of the site. All the old sheds were demolished however the extensive restoration of Pyrmont Bridge was and item of major expenditure. For all the above reasons, there have been negative opinions expressed in the past. However, any objective analysis demonstrates that the development is highly utilised and appreciated by the general Sydney public and visitors alike. The pedestrianized public realm with its excellent landscaping, water features and public buildings provides an attractive, refreshing counterpoint to the heavily trafficked street grid of the City of Sydney. The quality of the place has been enhanced by the recently completed “Darling Quarter” development. The Sydney Entertainment Centre was procured by the Wran Government and completed in the early 1980’s, prior to the commencement of the Darling Harbour Development. It is a well designed and conveniently located arena structure with a 100 metre clear-span and a maximum seating capability of 12,000. This facility was located in the city after extensive consultation with promoters of popular entertainments. The Government’s original intention was to build the building in Parramatta but the promoters had the strongly held opinion that a suburban location was not financially viable. The building was built under a “turn-key” design and construct contract by John Holland Constructions following an extensive competitive bidding process. The architect for the building was the late Jack Torzillo of Edwards Madigan Torzillo. Jack was a Sulman Prize winner for the “Boots” factory in Roseville (now demolished). Edwards Madigan Torzillo are best known for the High Court and National Gallery in Canberra. The building has been the target of criticism which appears to originate with persons associated with the “Superdome” a larger but under performing facility at Sydney Olympic Park, with the view sometimes expressed that Sydney can only support one arena structure of this type. With its robust structure, excellent sight-lines and generous space standards, the Sydney Entertainment Centre could easily be stylishly refurbished to create an outstanding venue. The work recently carried out at Hamer Hall in Melbourne is an exemplar of what can be achieved. In any refurbishment and redevelopment of the Entertainment Centre carpark site, connection with the Exhibition/Convention facilities could easily be improved. Darling Harbour was the site of a major goods yard inter-connecting the NSW rail network with the port of Sydney and the NSW Farm Produce Markets. By the 1970s the containerisation of shipping and the construction of the new Flemmington markets had rendered this facility obsolete. The Wran Government’s original intention was to make the site the location of “Expo 88”, a “World Exposition”. This was to be a joint venture between the NSW and Commonwealth Governments. However relationships between the two Governments and the Chairman of the Bicentennial Authority, John Reid broke down to the point at which the Wran Government decided to proceed independently with a development to be the centre-piece for 1988. In the early 1980s the Premier’s Department called for development proposals from private enterprise. These unfortunately proved desultory. In 1983 the Institute of Architects presented an excellent talk by the late Mort Hoppenfeld, then of the Baltimore Inner Harbour Development Authority describing the highly-acclaimed recent project in Baltimore. This appeared an appropriate model of what could be done at Darling Harbour and Hoppenfeld was invited to advise the NSW Government. The intentions of his sketch were largely realised and embellished in the ultimate development. MSJ-Keys Young were appointed design managers, designers of public spaces and a selection process led to Philip Cox and John Andrews being appointed as architects for the two major buildings, the Exhibition and Convention Centres, respectively. In the last decades of the 20th century the work of Philip Cox received increasing acclaim for a broad range of buildings. 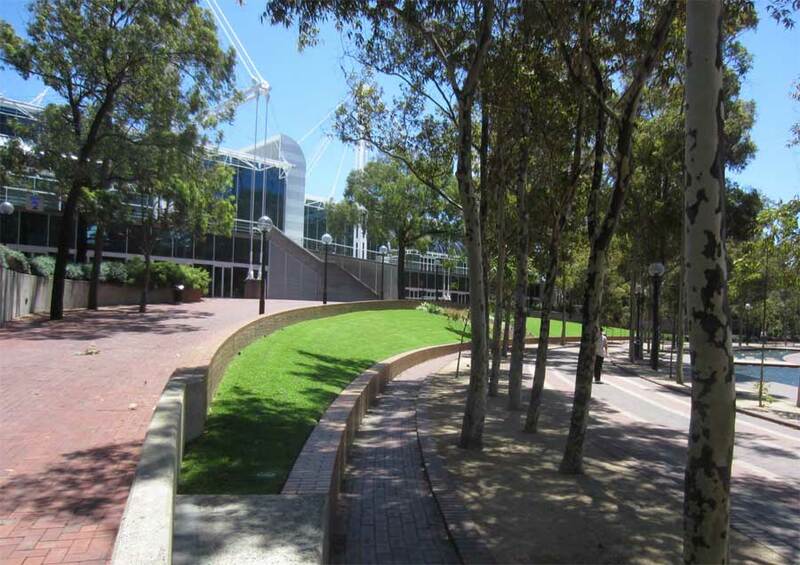 The Sydney Exhibition Centre is unquestionably one of his finest works and together with the refined geometry and landscaping of Tumbalong Park create an outstanding result. The building has 25,000 sq metre contiguous exhibition space on one level with large scale roof spans and is connected to a continuous lobby overlooking Tumbalong Park to the city skyline. It can be expanded to the South, to the SEC carpark site, by a lobby passing under the Pier Street overpass. If refurbishment is required, this would be far cheaper than providing a totally new building as well as a temporary facility. This building received the Sulman Award for architecture in 1989. This is a building of unquestionable architectural significance. Had another twenty years elapsed it would be on both State and National Heritage registers. The Convention Centre was designed by John Andrews, another Australian architect of international repute who came to prominence with his Scarborough College, near Toronto, Canada in the 1960s. One of the outstanding buildings of its decade. After several other major projects in the USA and Canada, Andrews returned to Australia and designed a number of other remarkable buildings in Sydney and Canberra. The Convention Centre demonstrates the hallmarks of Andrew’s style: strong sculptural invention, clearly articulated service elements and a powerful sequence of spaces. The building contains a number of excellent auditoria and meeting spaces. Visitors to the building experience a strong “sense of place” with dramatic views over the harbour towards the city skyline. The building is particularly successful in its visual relationship with the adjacent massive scale of the elevated freeway. The large sub-divisible auditorium has been used for a wide variety of events including Olympic weight-lifting. This building could easily be expanded to the north to the Harbourside Shopping Centre site where it could complement a new “Landmark: Convention/Hotel development. Twenty years ago, Sydney’s exhibition facilities were the best in Australia, however subsequently Sydney has fallen behind the offerings of other cities in Australia, and more particularly overseas in this highly competitive market. Darling Harbour is an ideal location for these uses. It is hard to understand why all three buildings need to be demolished and replaced when they could be added to and refurbished for far less cost than the current total demolition and rebuild proposal which requires costly temporary facilities during the construction period. If the underperforming and architecturally undistinguished “Harbourside” shopping centre were to be made part of the redevelopment, there would be a broad range of alternative options. In principle, the Exhibition Centre could expand to the south on the site currently occupied by the above. Cities grow and change and meet to remain imageful and competitive. There is better opportunity for a genuine landmark building, to create an unprecedented new image for Sydney on the Harbourside Shopping Centre site than in the current proposals. Unfortunately it is a sorry fact of life that considerable time elapses before buildings are afforded the protection of listing under state or commonwealth heritage legislation. NSW introduced heritage legislation in the late 1970s after the politicisation due to the “Green Bans” and demolition of many fine late 19th and early 20th century buildings. In the case of Darling Harbour there is cultural, social, historical and architectural significance in abundance – the problem is that all this significance has been generated in the last thirty years. Any methodical assessment would demonstrate that the various venues and the place itself have been the settings of many of Sydney’s major events for the past thirty years and that the principal buildings and parklands are of a high standard and make a major contribution to the image of Sydney. In the 1970s the “Green Ban” movement focused public attention at the irreversible losses being generated by the large scale redevelopment. Since that time Sydney has achieved a balance between conservation of the built and natural environment and the opportunity for economic growth and change. Few “new world” cities have achieved the retention of so much historic fabric as has Sydney with its 19th century inner suburbs of terrace housing as well as the “Rocks” and “Walsh Bay” precincts. The completeness and character of these areas are an indelible aspect of the ethos of Sydney. So it should be with the principal elements of Darling Harbour. That is not to say that there should not be change – there is much scope for extension and enhancement. The “Harbourside” shopping centre provides the opportunity for an outstanding extension of convention facilities and a superb site for a luxury hotel. The lessee of Harbourside could be assigned a lease of the ground and mezzanine levels of any new development as compensation. The Entertainment Centre carpark provides significant opportunities to expand the Exhibition Building. The service yard of the SEC could be eliminated to improve connection with the north – south desire line to Quay Street. In such a scenario what is good about the legacy of the site would be maintained with exciting prospects for what would be new. The twin-tower, high-rise hotel seems to fit most uncomfortably on the tiny triangular site that is the current arrival and taxi rank to the convention centre. The need to cantilever the towers from the base is a demonstration of this difficult relationship. The faceted planar forms of the Convention Centre have a poor relationship to the freeway compared with the carefully considered geometry of the existing John Andrews building. The building appears to “oversail” Bob Woodward’s masterpiece, his recessed, helical fountain. This would have a detrimental effect on this important work of art. The exhibition building appears split equally over several levels with a consequential lack of efficiency and amenity when compared with the current building (if expanded). This aspect has already received negative comments from the exhibition industry. Part of the building appears to have a turfed roof, well above street or park level. It is difficult to see how this would adequately compensate for significant loss of public open space at ground level. It is also hard to imagine that this could be considered “defensible space” outside daylight hours. The architectural expression of his building with its small-scaled cantilevered boxes and balconies appears to belie the reality of the building being a large floor-plate universal space. The building has a particularly uncomfortable relationship with the southern edge of the elevated freeway, which it appears to abut. The architectural expression of this building compares poorly with Philip Cox’s seamlessly integrated statements in the current, Sulman award winning Exhibition Building. Tumbalong Park is possibly Australia’s finest landscape design of recent decades. Its gently disked lawn enables it use as an informal amphitheatre. Its continuous lawn enables its use for informal games such as “touch – football”. Its space is beautifully defined by the annular girdle of spotted gums and beautifully detailed stepped or recessed water feature. All of these qualities will be destroyed in the proposed reconstruction: the amphitheatre is flattened, the integrity of the lawn is destroyed by five diagonal pathways, the spotted gums are chopped down, the water feature is demolished or largely filled in. What was distinctive and beautiful becomes commonplace. The proposed Arena building with what appear to be 30 metre high clear glazed lobby walls facing east and north seems like model of great operational expense. The expressed functionalism of the current Sydney Entertainment Centre appears fresh and uncontrived in comparison. Negative comments have already been made by the popular entertainment industry about the negative impacts of 30% reduction in capacity when compared with the existing building. There appears to have been the failure of a proper process to effect a major development that has a multitude of impacts. • an approval process to revised master plan and project applications. At all stages there has been the opportunity for public comment. In the case of Darling Harbour, the Government has chosen to go straight to a private enterprise bidding process, leaving no room for the consideration of real alternative solutions. This report is not an argument that there should not be change. The city needs to evolve and facilities need to survive competition. The issue is given the vast expense of the proposal and the impact upon items of cultural significance that would be destroyed, there is the need for the Government to review its brief.